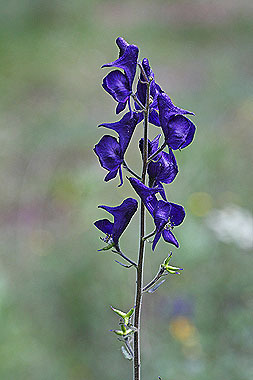 Monkshood is a tall plant growing in moist areas in the mountains. Blue-purple flowers appear in loose racemes at the top of slender stems. Blossoms have a distinctive hooded petal. Leaves are palmately divided with toothed lobes. Plants are poisonous. 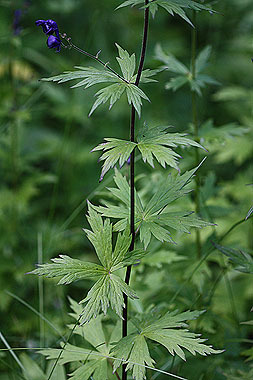 Compare to Delphinium barbeyi (Subalpine Larkspur) which also has dark blue-purple flowers, but the blossoms lack a hood.